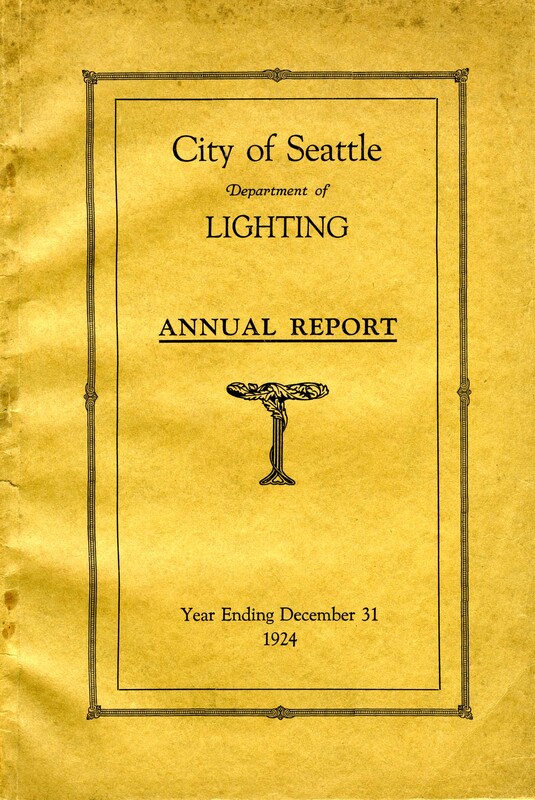 On Sept 16, 1935 City Light moved into this its new building at 3rd Avenue and Madison Street – or Spring Street for it stretched the entire block. 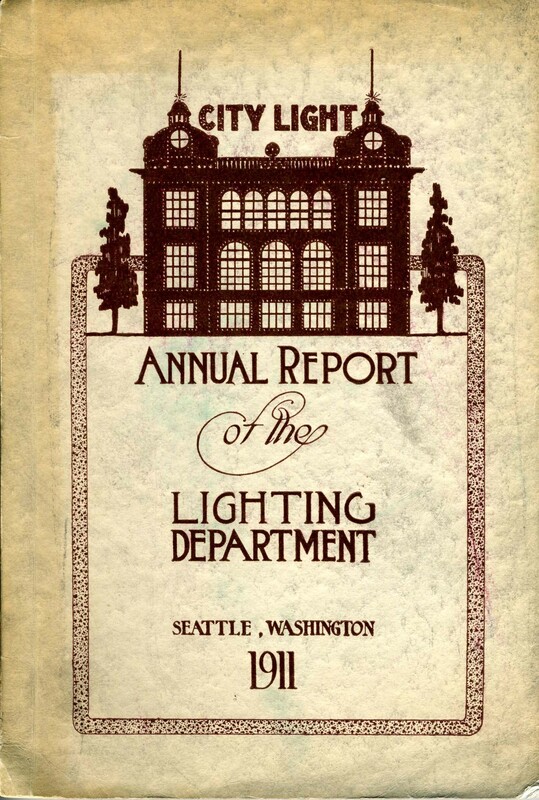 The agency’s 1935 Annual Report claimed that it was “the most modern building in Seattle.” It was also 24 stories shorter than hoped for and about four years late. 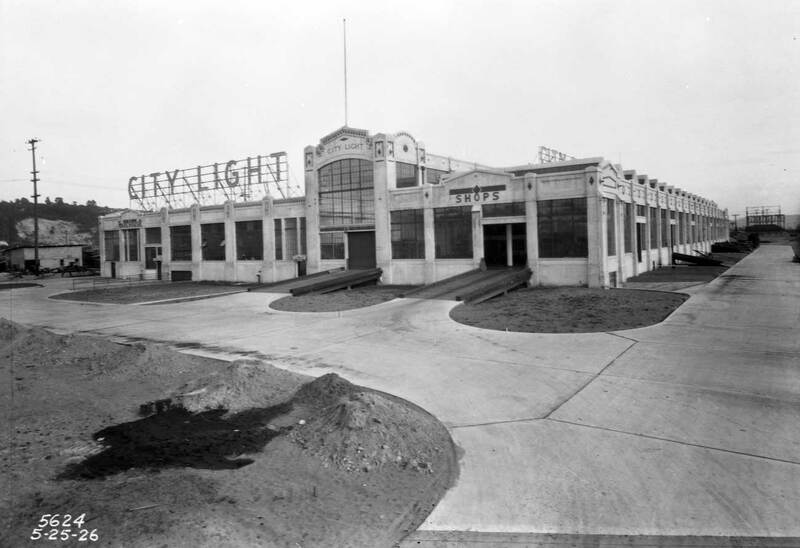 City Light purchased this half block in the 1920s primarily to locate its central distributing station for the business district. Above the basement substation two floors would be reserved for sales and agency offices. The additional 24 stories would be rented making City Light a landlord – a big one. From these ambitions the agency, upon reflection, soon withdrew. It did not want to compete with some of its customers as a landlord. Instead the project and its skyscraper were leased to a private building company. 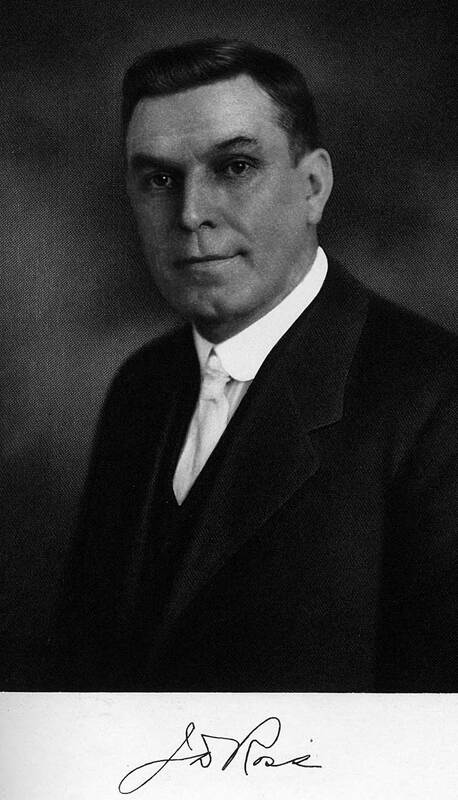 The deal was signed in February 1930, only three months after the economy crashed. And so soon did these grand plans in private hands. For sixty years it kept to this corner, and along the way added nine stories more of green class above these two. 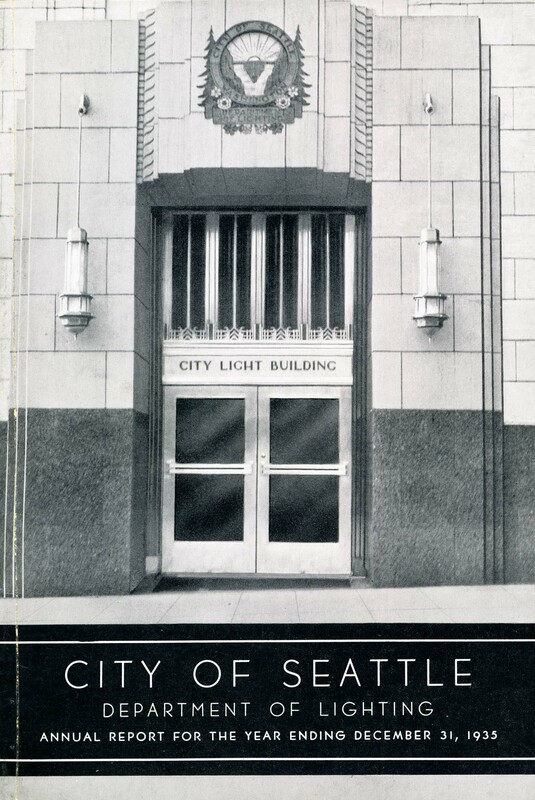 In 1995 the agency moved into the Seattle Municipal Tower. 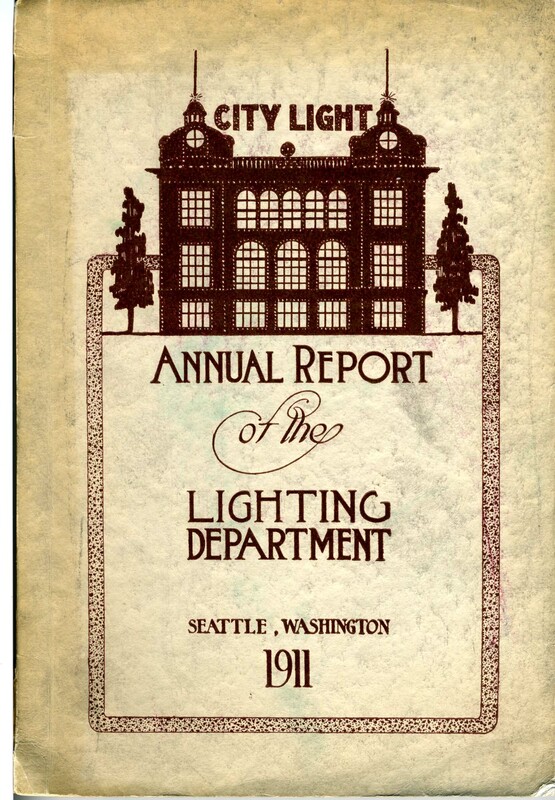 There are, of course, many more stories in the history of City Light than in even its dropped skyscraper of 1930, and now Historylink, the web encyclopedia of Washington State history, reveals and sometimes exposes them in their new book ‘Power for the People.” It is well illustrated and on the cover David W. Wilma, Walt Crowley and The HistoryLink Staff are credited. 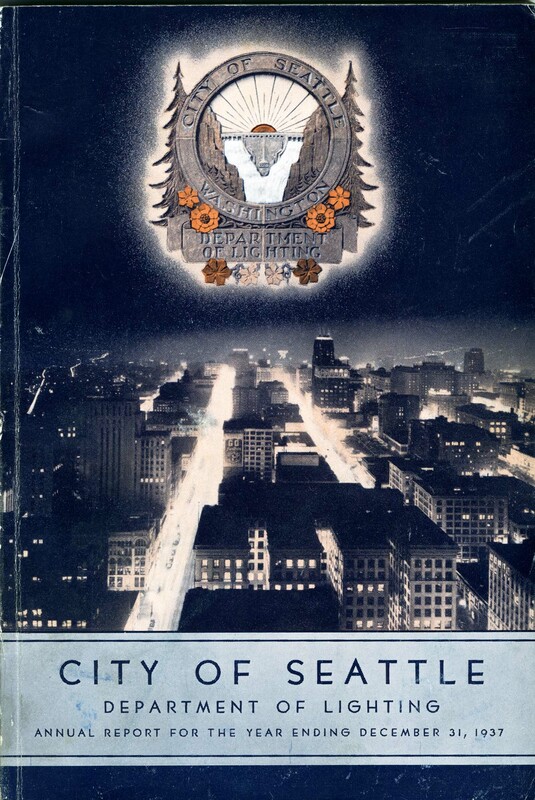 David reminded me that when it was planning the 24 story tower “City Light paid for all its operations out of rates, not taxes, and the rates were dirt cheap.” You can find “Power for the People” in most surviving bookstores. 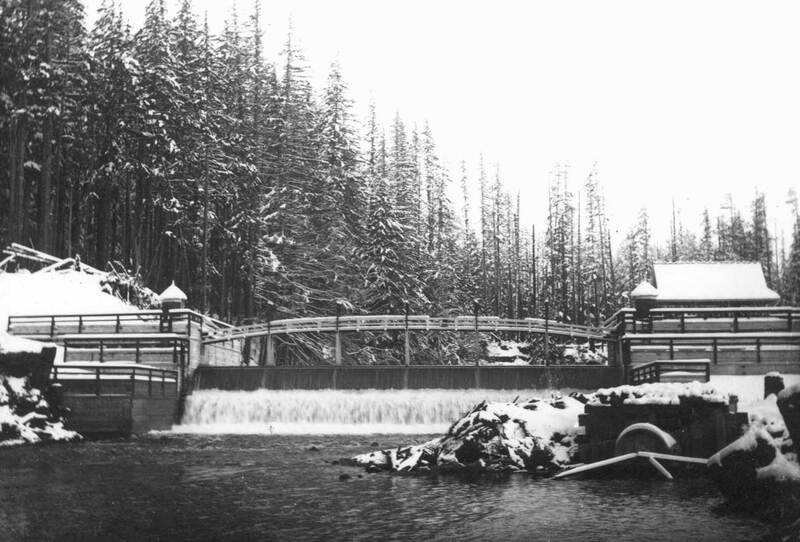 In 1902 the citizens of Seattle voted 7 to 1 to pay for the timber dam that city engineers proposed to build on the Cedar River. 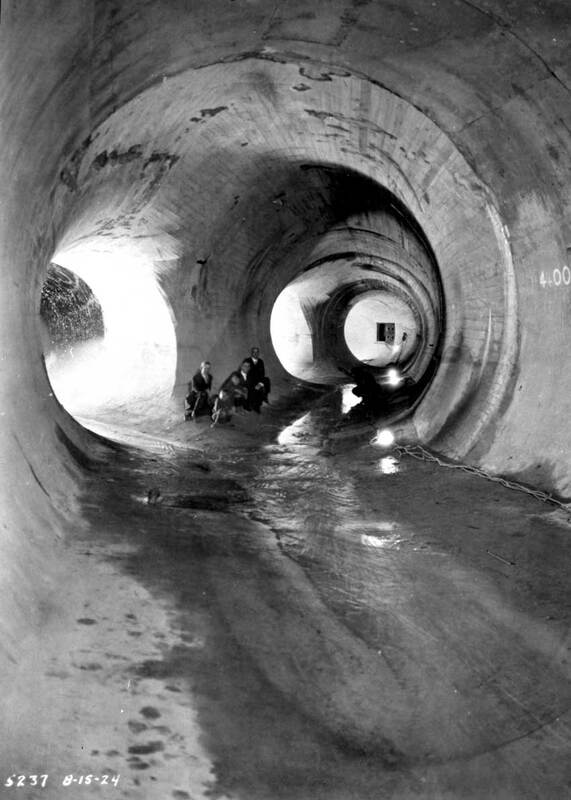 Power from the dam was planned to light the city’s streets. 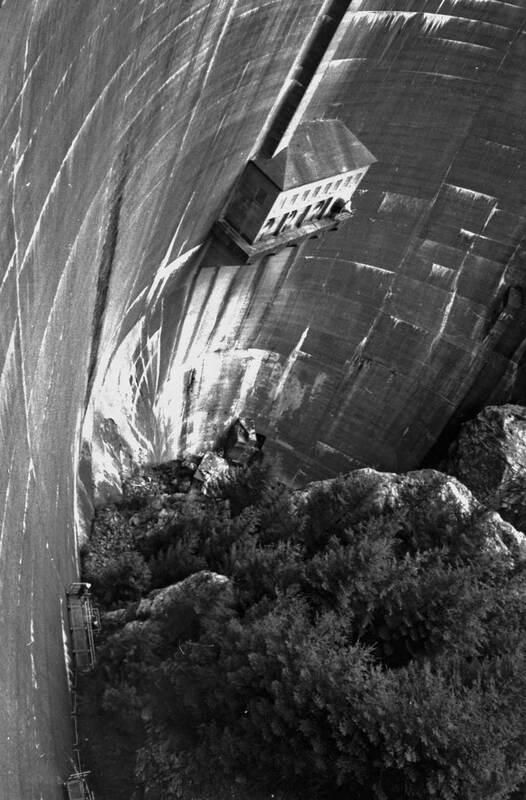 When the first generator started to hum in 1904 they voted again to extend his public power into their homes. 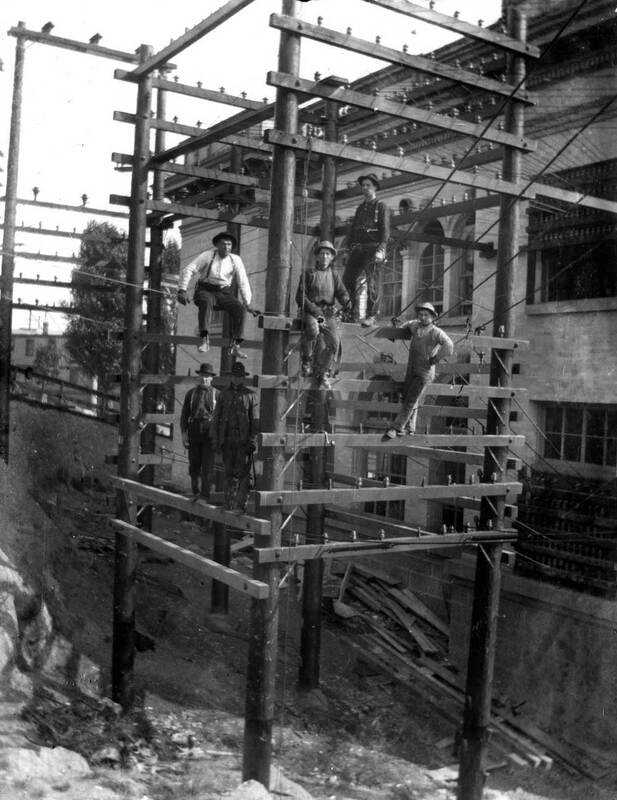 They would do it competition with private power that was wiring the city as well. At the rear of the Yesler Way substation. 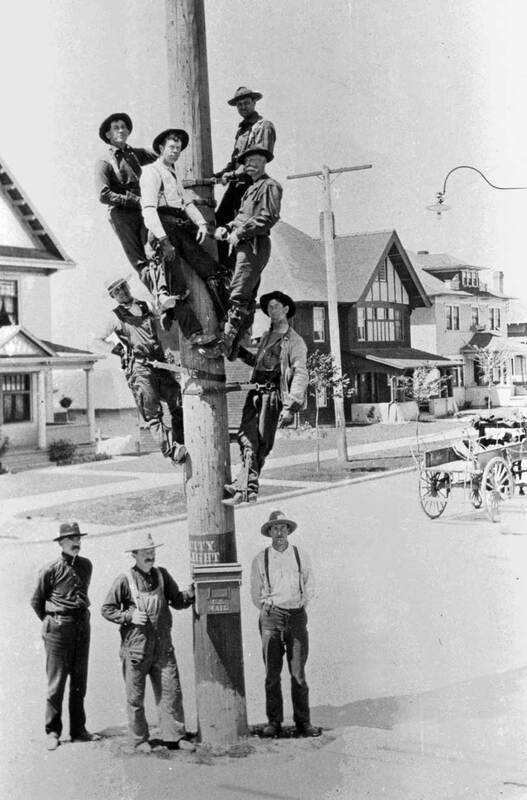 An early City Light line crew. 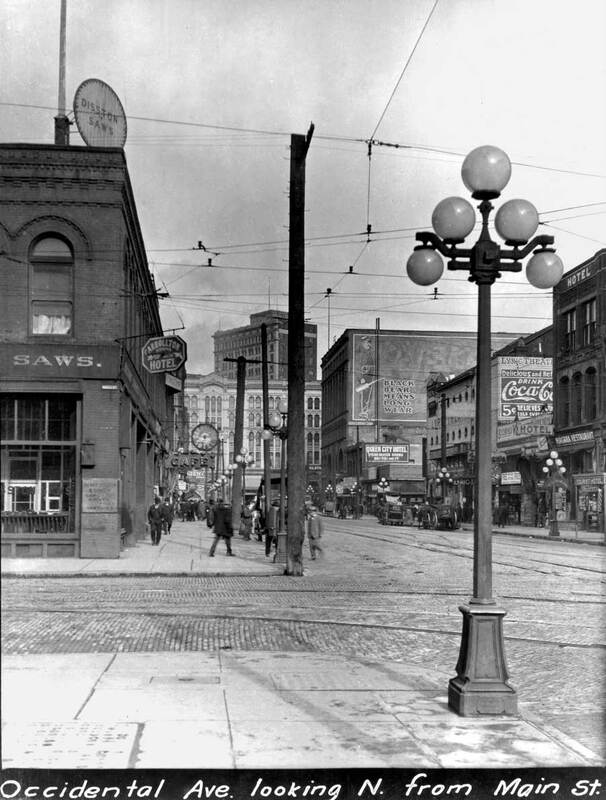 By 1911 the likely year this’ view of the substation was shot across the intersection of Seventh Avenue and Yesler Way, City Light was earning twice as much as it was spending. Consequently, it lowered its rates every year, and thereby drove down private power’s charges as well. Looking north from Main Street on Occidental with an example of the city's new 5-globe cluster lights. 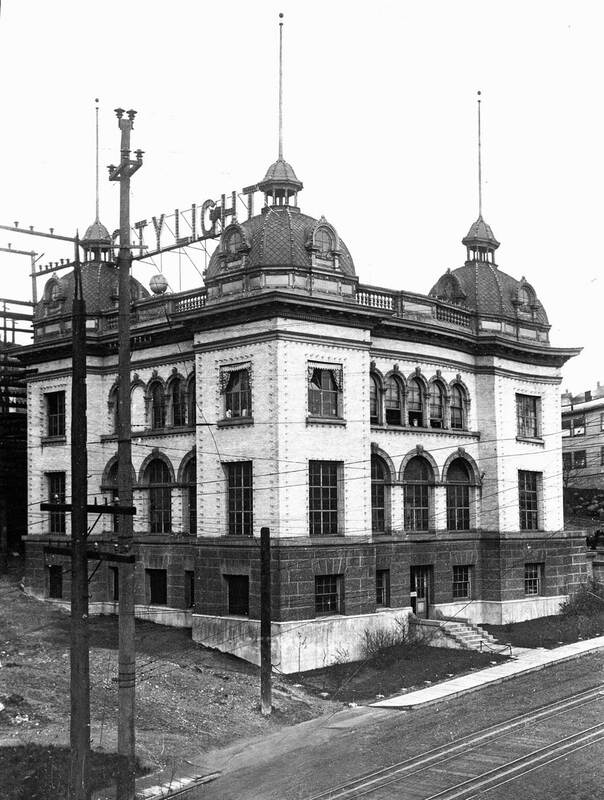 Seattle City Light opened its South End service center on Spokane Street in 1926 – the year this photograph was recorded – on land then recently reclaimed from the tides. Seattle architect J.L. 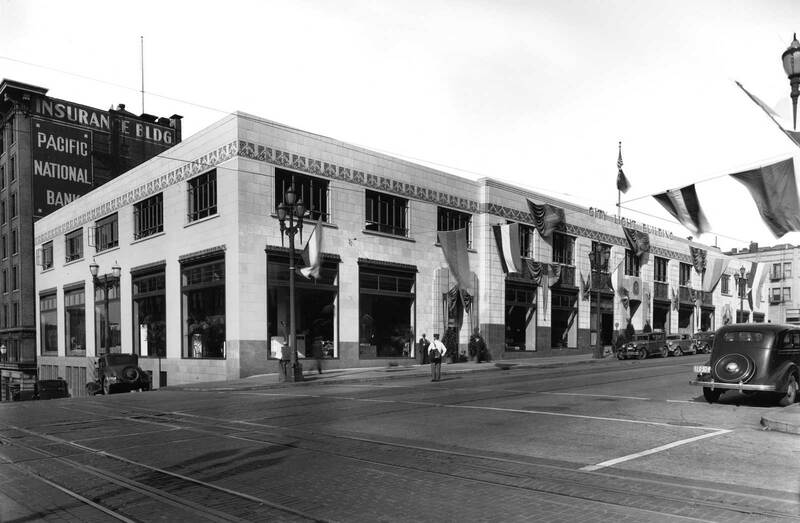 McCauley’s public building was not only functional but attractive. As the historical scene reveals, the restrained ornament used in the service center’s concrete forms has been enhanced with a wrapping of the building in a skin of stucco and off-white plaster. 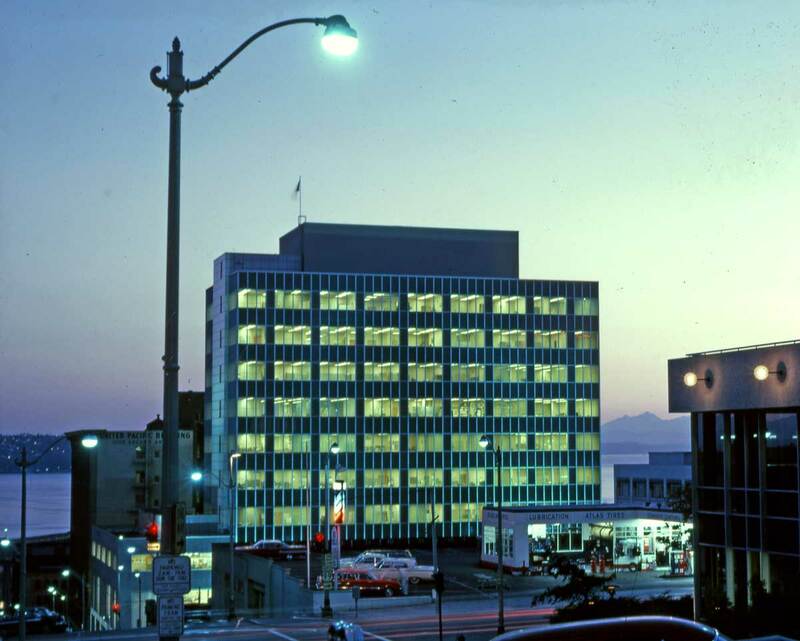 The building survives, although its north wall facing Spokane Street was hidden in the 1960s by the textured concrete panels. 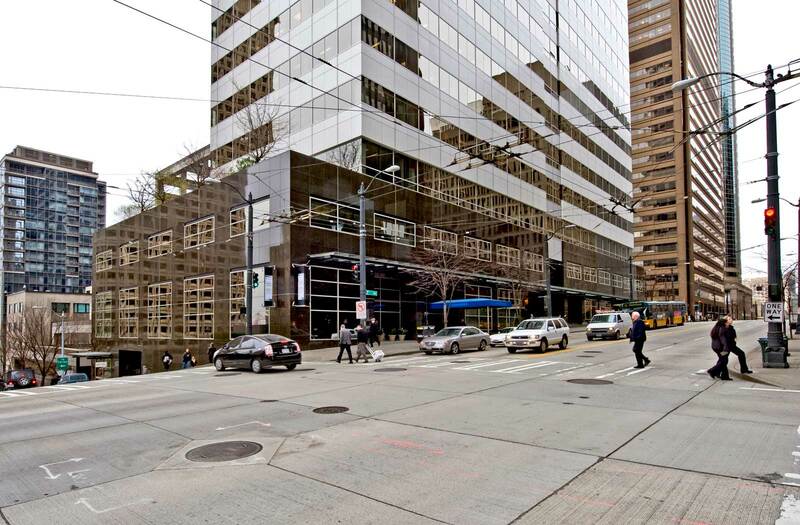 In the spring of 1997 when this text was first written, a new north wall was in the works that would how to visitors and Spokane Street traffic a curvilinear facade ornamented with public art made from recycled glass. Inside, a two-story skylit atrium was planned to repeat the roof forms incorporated in the building’s original design. (I suspect that these changes were completed for in ’97 there was no worrying recession.) The sawtooth roof, which runs nearly the length of the center’s west (right) wall above the shops, is to these eyes the historical plant’s strongest architectural feature. 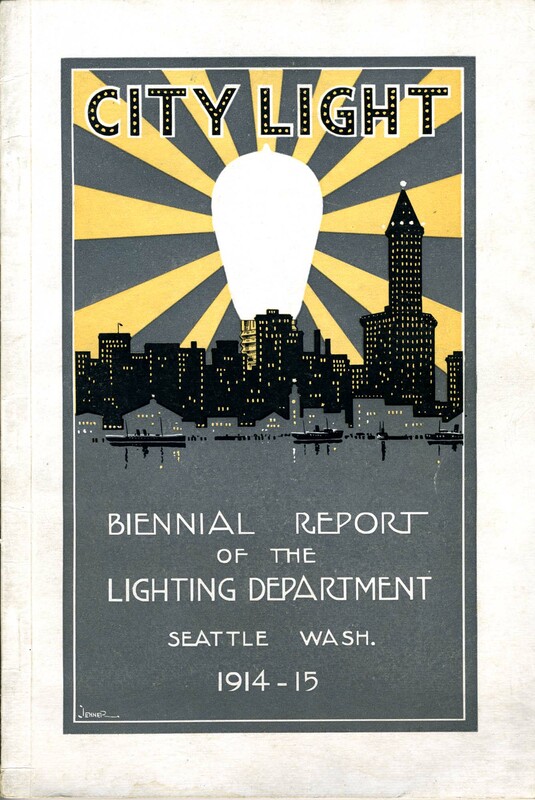 The twenties were a decade of endless tests for City Light, as it developed the first of the Skagit River’s generators, Gorge Dam, and fought a service war with Puget Power when lines for the public and private utilities were still duplicated throughout the city’s streets. 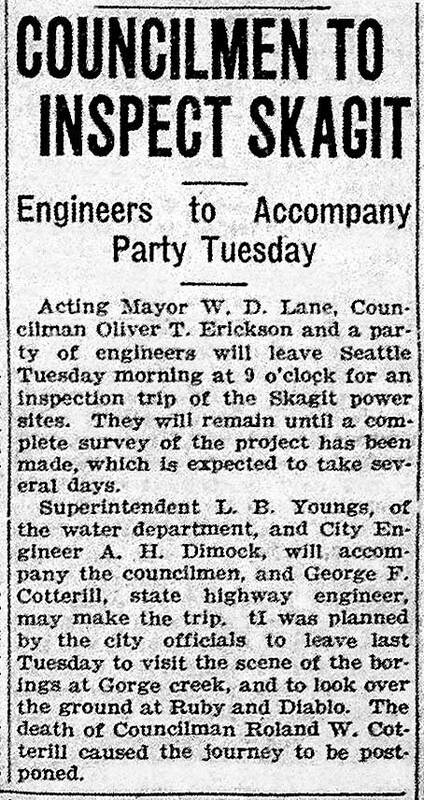 A short report in the Seattle Star for May 12, 1919, about Seattle council members intentions to visit and study the Skagit as a source of hydropower. 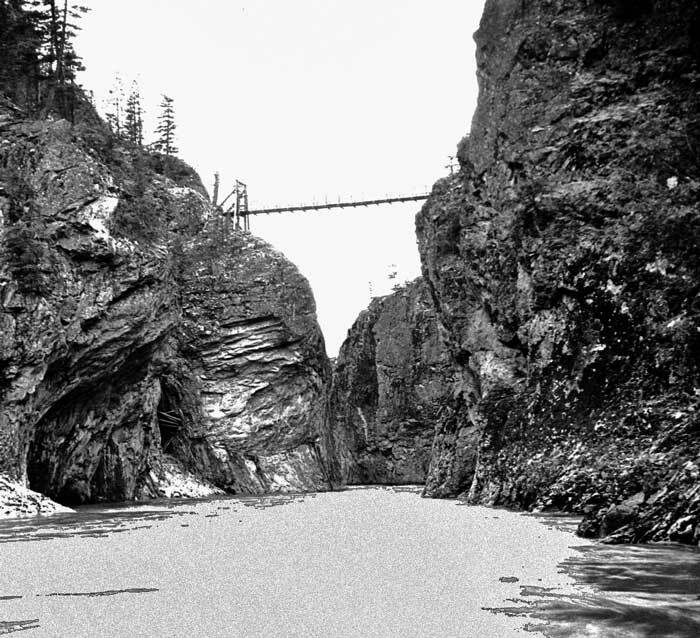 The Diablo canyon on the Skagit River where City LIght's Diablo Dam was constructed, and began to supply power in the mid 1930s. 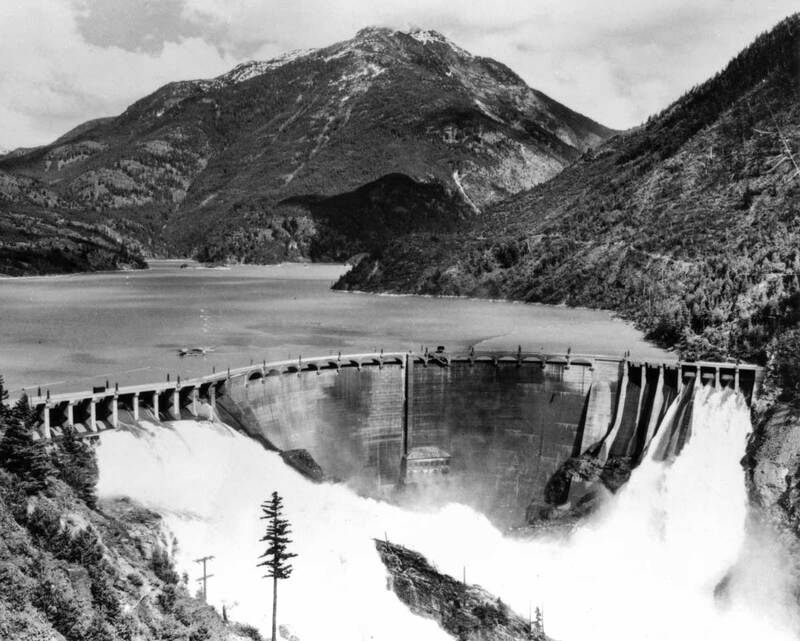 Diablo Dam with Ruby Mountain beyond. Steel plate Y for Diablo. R.H. Thomson stands third from right and J.D. 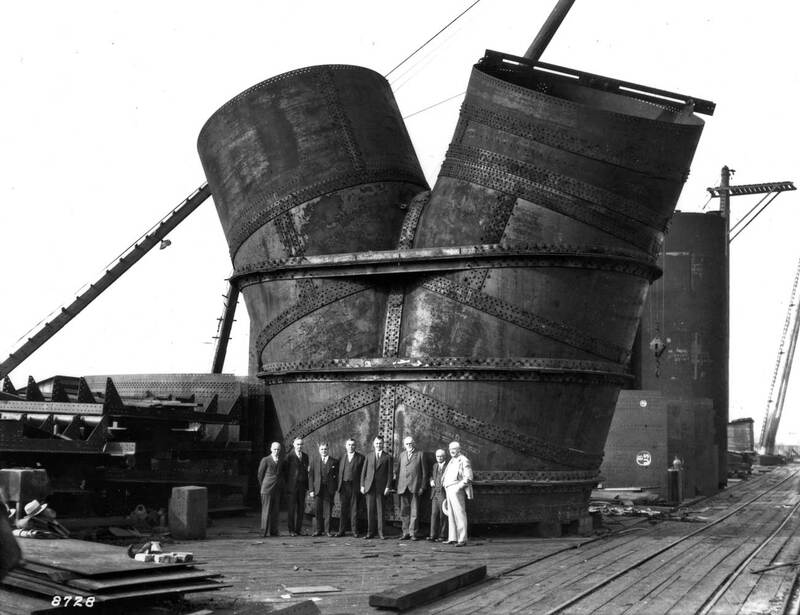 Ross fourth from the left. 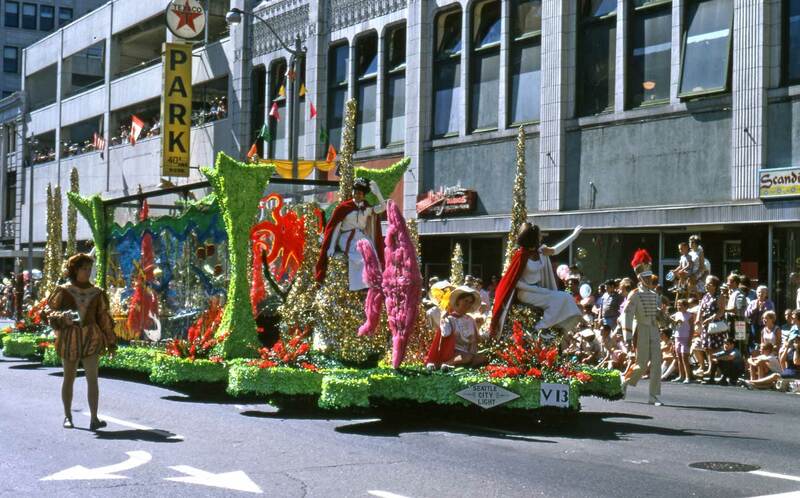 Seattle City Light float in the 1969 SeaFair parade. 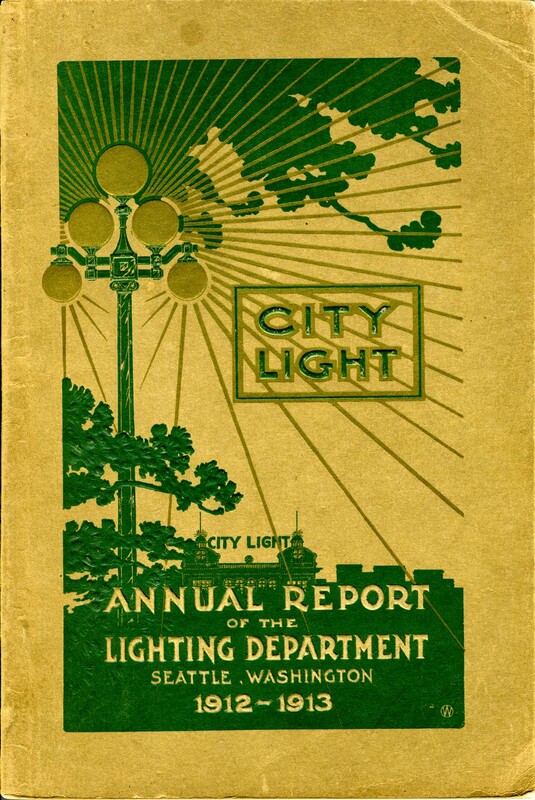 Below are a few examples of covers to City Light Annual Reports, that Ron Edge has pulled from his collections. It begins, however, with the competition – a link to Stone and Webster’s small 1909 booklet in pdf format. 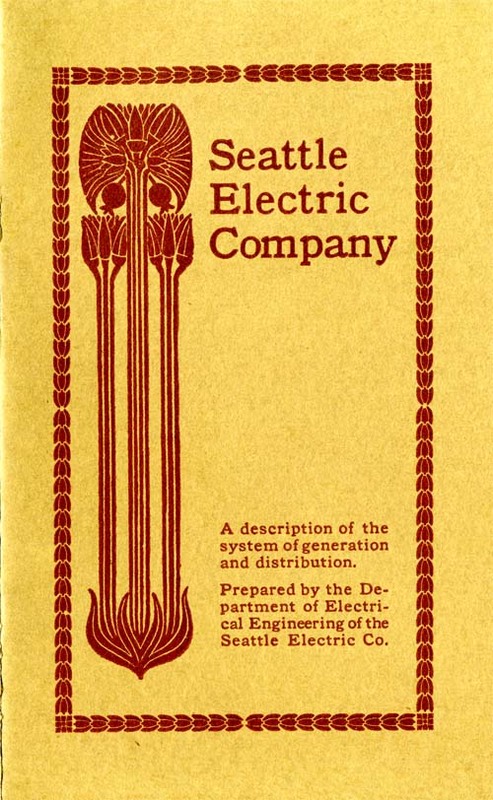 It was published by the city’s private power competition, the Seattle Electric Company, the local holding of the Boston firm. You probably know me as a friend of Inger Anne’s from back in the day. I went by Charlotte Lyons then. Dad’s great passion was mountain climbing. He was a founding member of The Mountaineers and The Mountain Rescue. He liked working for City Light because he could re-arrange his hours to go on lots of climbing trips. Working Night Shifts etc. he was unfortunately killed in the mountains in a freak accident in May of 1968. His name was Ray Rigg and he was a GREAT guy.